Stanley Falls Senior climbs the fat right hand ice, Chalkstoned is the mixed line on the left. Approach: Park at a pullout beside a large open area just South/East of Beauty Creek Hostel along the Icefields Parkway. This is the same parking area as for Shades of Beauty. Hike along an old road then a trail leading up the valley beside Beauty Creek. After about 1 hour, Shades of Beauty will be up on your right, and these routes will be up the slope on your left. Hike up the slope to the climbs. 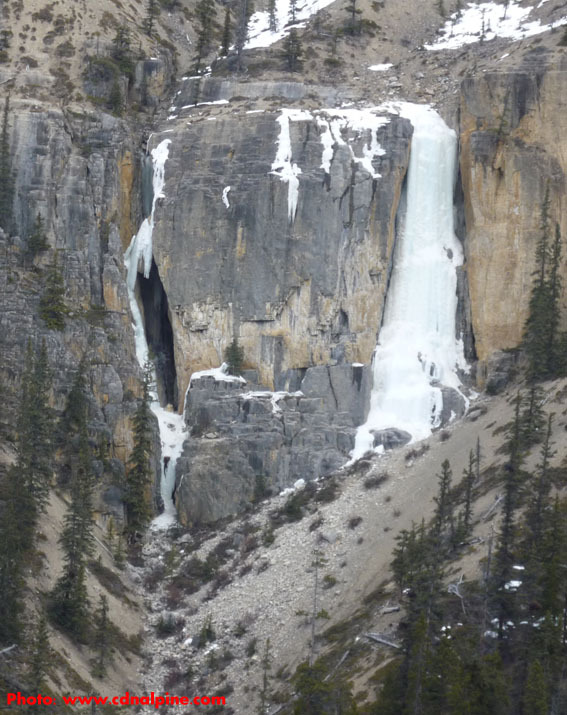 Route Description: Stanley Falls Senior is usually a nice fat pillar of ice that gets progressively harder as you climb higher. Chalkstoned has some fun thin ice & mixed climbing up to 5.8. Gear: Screws for Stanley Falls Senior. Screws (including stubbies) and some rock gear for Chalkstoned. 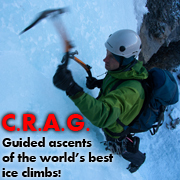 Objective Hazards: The climbs are in the sun so rock & ice fall may be an issue at times.